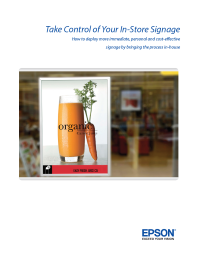 Download this paper for an overview of retail signage and how in-house wide-format print technology can make or break your business. Retailers know the importance of visuals to reinforce their brand, and that in-store signage is a key part in bringing customers to the checkout line. But there are new strategies retailers should consider as technology evolves.